Then, the Steelers were outclassed 26-14 by the Ravens in Pennsylvania, leaving Ben Roethlisberger and co languishing at the bottom of the AFC North, while Joe Flacco's lot sat atop. However, that game proved to be a turning point in the Steelers' season. with Pittsburgh on a six-game win streak since. They're latest success was a tight, testing triumph over the Jacksonville Jaguars - sealed with a Ben Roethlisberger touchdown run in the dying seconds - after hammering the Carolina Panthers and gaining revenge against the Ravens off the back of wins over the Atlanta Falcons, Cincinnati Bengals and Cleveland Browns. Highlights from the NFL as Carolina Panthers took on Pittsburgh Steelers in Week 10. Before their current run, way back in Week Four, the Steelers seemed a dysfunctional unit, one incapable of stringing together the four wins that have since followed, particularly with star running back Le'Veon Bell's continued absence creating a glaring gap in Mike Tomlin's offense. Bell is now a confirmed no-show in Pittsburgh - he failed to report to the team by the November 13 deadline in order to be eligible to play this season. His non-appearance, however, has given second-year runner James Conner the opportunity to showcase his talents and the 23-year-old has done just that. Having successfully beaten cancer in 2015, Conner was drafted in the third round by the Steelers in 2017 - but the rookie made little impact in his first season, with Bell ahead of him in the pecking order and putting up over 1,200 rushing yards for a second consecutive season. This year, Conner is relishing his role as the team's starter. Aside from creating Steelers history, by becoming the first Pittsburgh player to score two or more rushing touchdowns in three consecutive matches, and he has registered 100-yard games in five of 10 games. Conner has more than doubled the amount of touchdowns that Bell had through nine matches in 2017 - 11 to five - and has better yards-per-rush (4.6) and yards-per-reception (9.1) stats too. It's equally hard to overlook the impact Antonio Brown continues to have for the Steelers. 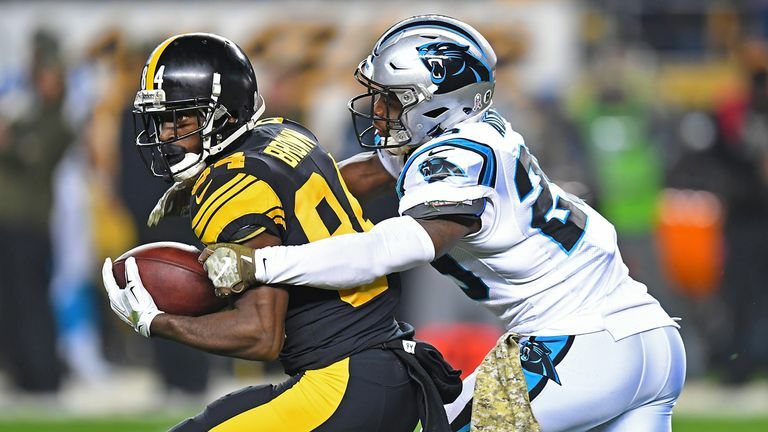 In his eighth year with Pittsburgh, the wide receiver pulled off a franchise-record 16th multi-receiving touchdown game - surpassing Hines Ward's tally - in their win over the Browns. Through 10 games this season, he is the NFL's leader with 11 touchdown receptions and is on course to beat his season-best of 13 from 2013. Brown has picked up at least 50 yards in every game bar one this season and over 100 in the first three of the Steelers' six-game winning streak, against the Falcons, Bengals and Jaguars last week. He and Roethlisberger are one of the NFL's best ever quarterback-wide receiver pairings. They have now combined for 70 touchdowns - the seventh most in league history, having recently surpassed Peyton Manning and Reggie Wayne. There can also be no overlooking 'Big Ben' when dissecting the Steelers' turnaround this season. The 36-year-old has 23 passing touchdowns so far and three rushing, including that game-winner against the Jaguars. 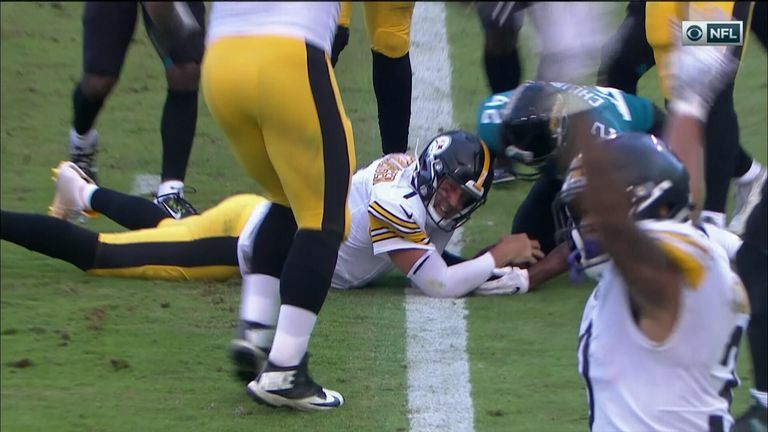 Ben Roethlisberger dives over for a touchdown in the dying second to win it for the Steelers against the Jaguars. Roethlisberger has just over a 75 per cent pass completion when targeting his tight ends, slot receiver and running back. And the long-serving Pittsburgh QB tied Terry Bradshaw in the win over the Browns as he earned his 11th home win against the franchise - making him just one of four players to complete such a feat in NFL history. Can anyone stop the LA Rams? In short, there is plenty for Steeler Nation to be positive about right now. Who are the top sleepers in the NFL Draft?